It’s sad and it’s true. Unscrupulous scam artists take advantage when they can and where they can. With our Scam Prevention Series, you can be a hero in your community. Education and awareness leads to empowerment. 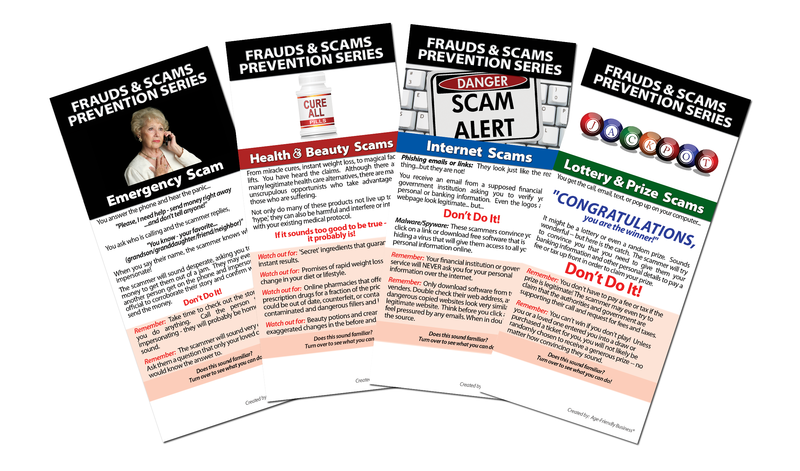 Order this Scam Prevention Series for your customers and clients. Order the Customized Series – Connect Your Name With Caring More! Receive more scam alert cards and customize the cards with your logo or contact information or both! Fabulous way to show how you care more and serve better. 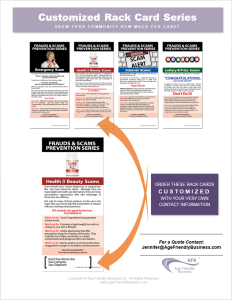 Simply choose the scam topics you would like to order, and the number of cards you would like printed for each topic (minimum order of 50 cards per scam topic.) The prices are listed below. Contact Jennifer@AgeFriendlyBusiness.com with the details of your order and if you want them customized with your logo and/or contact information (she will guide you on the customization requirements.) You have final approval for the customized sections of the scam cards. Appropriate taxes and shipping will be added to the above quotes.